@JonathanLittle finds himself with a bluff catcher on the river, and plays it the only way you can. Hand review: @JonathanLittle analyzes a hand from a $25,000 buy-in event at the Seminole Hard Rock. Today's hand comes from a $25,000 buy-in tournament I played at the Seminole Hard Rock and illustrates the importance of not trying to play for all the money when what you have is essentially a bluff catcher. The blinds were 250/500 with a 75 ante, and I began this hand with a relatively deep stack of 90,000 or 180 big blinds. A player with an even deeper stack opened with a raise to 1,500 from the button, and it folded to me in the big blind where I'd been dealt . I called and the flop fell . I elected to check with my top pair, and my opponent bet 2,000 (close to half-pot). As I explain below, with drawing hands I might like to check-raise, but with this dry board and my modest made hand I just called. The turn was the and we both checked, then the river completed the board. With top pair and a marginal kicker, value betting isn't out of the question, but here I checked. Watch and see what my opponent did and how I responded, and listen to my discussion of my decisions throughout the hand and on the river. 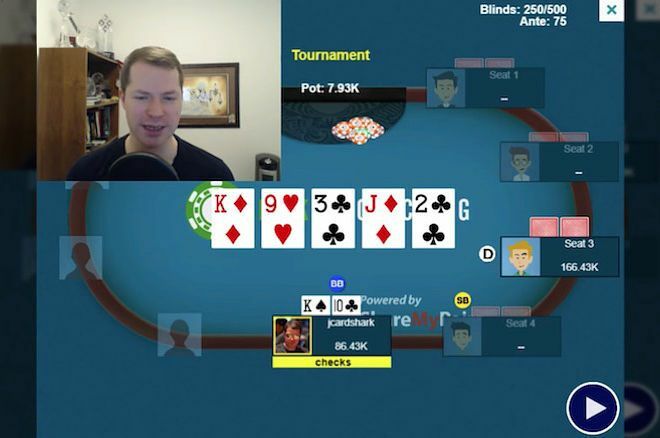 While this hand is interesting to discuss with regard to my check-calling with what is essentially a bluff catcher on the end, it's also interesting to look at from the perspective of my opponent who I think missed value by not betting the turn. What do you think of how my opponent played this hand? Don't Wait at the World Series of Poker!